NOTE: The BMW F850 ADV and some Standard models are being shipped with different side stands, at this time our Side Stand Enlarger will only fit one of these side stands. 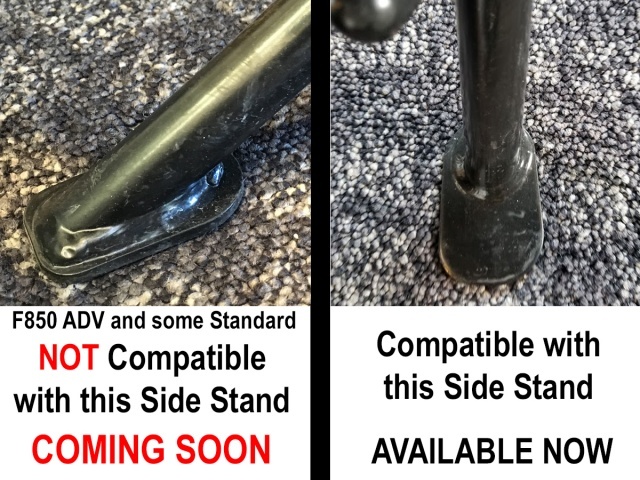 View the comaprison image to the right in order to determine if this part will fit your side stand. If you’ve just bought a brand new BMW F 850 GS, the last thing you want is for the bike to tip over because the side stand sinks into the ground. This happens quite a bit, and is something to watch out for when parking in dirt or gravel, and even on blacktop on a hot day. The good news is that this situation is avoidable with the addition of AltRider’s Side Stand Enlarger. AltRider’s Side Stand Enlarger for the F 850 GS is offered in a silver brushed steel finish or black powder coat finish.